Federal science funding is at the heart of the American enterprise. 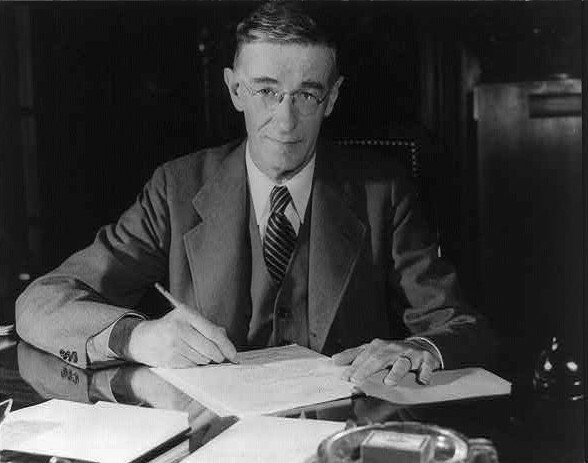 Sustained science funding was first established as the core of US science policy in July 1945, when Vannevar Bush, Science advisor to President Roosevelt, wrote “Science the Endless Frontier”. That laid the foundations for government agencies like the National Science Foundation and the National Institutes of Health. Since then, every administration has used a certain percentage of tax revenue to generously fund US science. Scientists don’t ‘own’ these funds. Instead, winning a grant to do research places us into a position of stewardship of public funds. The opportunity to push back Vannevar Bush’s Frontier of Science comes with an obligation to be accountable for the funded project, committing us – explicitly and implicitly – to produce project reports, review others’ proposals, and communicate our findings in the form of presentations at meetings, scientific papers, or patents. The new science produced from a given grant opens up new questions, which are then formulated in the form of new grant applications. This way to conduct and fund science follows a proven model that works well. Nationwide suspensions to science funding only occur during government shutdowns. Unlike previous shutdowns, the 2013 Government Shutdown was the first to be experienced online, allowing for an unprecedented live-view of events as they unfolded. Now that the shutdown is over, and a new one is possibly looming in early 2014 (though perhaps not, with the recent budget compromise? ), we have a little bit of time to reflect on its impacts on scientific research, enabled specifically by the nature of instantaneous internet communication. 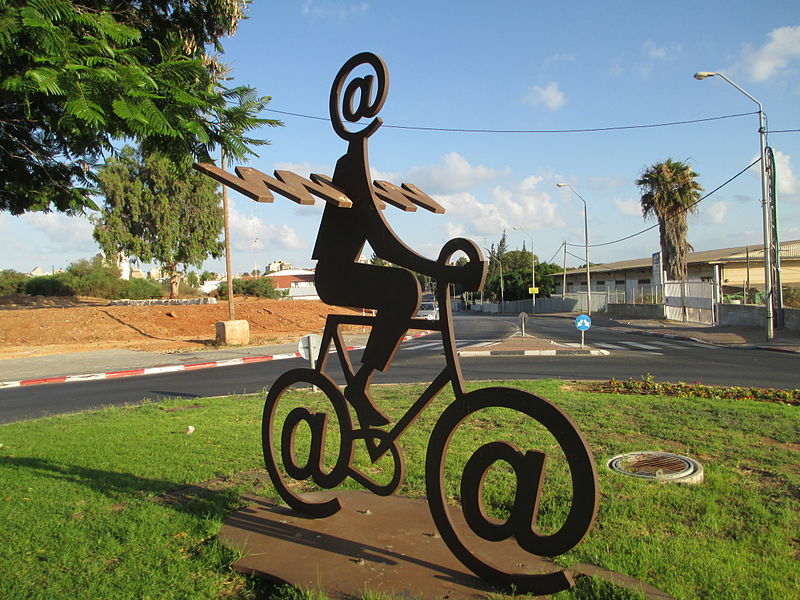 The Internet Messenger by Buky Schwartz. Photo via Dr. Avishai Teicher. For me, it all started on 27 September 2013 at 5:25 PM. An email from the Research Administrative Branch of the Procurement Office at NASA’s Shared Services Center arrived in my inbox. The subject line read “NASA Grant and Cooperative Agreement Recipients, Potential Lapse in Funding”. Being a recipient of such a cooperative agreement with the National Aeronautics and Space Administration, I opened the mail and began reading. “As you are aware, annual funding for the Government expires at midnight on September 30th. If a lapse in funding were to occur, all NASA installations would be forced to shut down with limited exemptions for specifically excepted activities.” My immediate response was “so, they will tell the folks on the International Space Station that the oxygen will be turned off at that time? Hold your breath ‘till further notice?” It didn’t seem real – even to somebody who had experienced the last shutdown of ‘95–’96 during his second year of graduate school. So I brushed off the note. Two days later, on 30 September, an automatically generated email from the National Science Foundation reminded me that reports for one of my grants were due. That same day also brought the good news that two grants were funded that will allow my research group access to the state-of-the-art facilities at the Environmental Molecular Science Laboratory at Pacific Northwest National Laboratory (PNNL), funded by the Department of Energy. I spent much of the day preparing for the teleconferences to discuss the projects with colleagues. So, though I was somewhat worried about the impending shutdown, things seemed to be going quite well leading up to it. On the evening of 30 September, CNN, MSNBC, and other news agencies reported the beginning of the government shutdown. I spent the early morning hours of 1 October reading the news and didn’t think that there would be much of an impact on science, mainly because I kept getting emails from NASA to serve on a panel up until around 6:30 AM. Then, at 9:51 AM, the first concrete evidence arrived in my inbox that indicated the situation was serious. An email from the same office that had sent the original note on 27 September now had as the subject line “Federal Government Shutdown due to Absence of Appropriations, NASA Grants and Cooperative Agreements.” The message began with “As of October 1, 2013, there are no longer appropriations for Federal Agencies, including NASA. As a result, all NASA installations are forced to shut down with limited exemptions for specifically excepted activities.” So they DID turn off the oxygen. Not to the space station but certainly to most other activities. A New York Times headline from that day stated that 97% of NASA was closed. What was going to happen to my cooperative agreement? My grant? Research unfortunately costs money, and the source we all compete for when writing our grant proposals had just been shut off until further notice. One of my research lasers. Not pictured: costs associated with running the laser. Compared to me, a University Professor who enjoys full, continued access to his institution at any time, it must have been terrible for the program officers. At the funding agencies, program officers process the grants that we submit, oversee their review, and manage the cash flow of awards that are funded. I emailed my program officer at NASA to request clarification and promptly received the following message (subject line “Automatic reply: Federal Government Shutdown due to Absence of Appropriations, NASA Grants and Cooperative Agreements”): “NASA is currently closed due to a lapse in government funding. I am in furlough status; therefore, I am unable to respond to your message at this time.” Furlough means no pay (as it turns out, many government employees were paid parts of their wages retroactively, albeit informed of this payment following several weeks of financial uncertainty) – and no access to one’s office. Imagine being a program officer and not being able to process the incoming proposals and reports that scientists were undoubtedly preparing during the shutdown. While my research group could continue like this for a while, the entire foundation upon which continued scientific discoveries depend was frozen indefinitely. It was heartbreaking and terrifying at the same time. What Can I Do in the Meantime? I then thought about my progress reports due at NSF – without which any pending grant proposals wouldn’t be processed – and again, an automatic reply from two program officers there stated “Due to the lapse in government funding, National Science Foundation websites and business applications, including NSF.gov, FastLane, and Research.gov will be unavailable until further notice. We sincerely regret this inconvenience. Updates regarding government operating status and resumption of normal operations can be found at http://www.opm.gov. In cases of imminent threat to life or property, please call the Office of the Inspector General at 1-800-428-2189.” A news story that aired on National Public Radio put this statement in perspective. Scientists at the NSF’s Antarctic Science Program were facing the decision about whether to abandon their post or continue their research and risk being stranded without continued US support. Clearly, I was not going to be able to fill out the online forms for my grant reports, and send in my reviews of others’ grant proposals I had received earlier to review, not to mention submit new proposals. Moreover, as I prepared a new proposal for a later submission date, several important questions arose that I needed to run by program officers, but they were barred from answering my emails or returning my phone calls. Questions regarding supplemental funding for our PNNL user proposal, encouraged by the Department of Energy, went unanswered. Much of the scientific activities during the two weeks of the shutdown, which is typically one of the most active proposal writing time periods in the year, were delayed. Instead of pursuing new science, we reverted to writing manuscripts for future journal articles on the research results we had already acquired. Instead of looking forward toward our future endeavors, the scientific community simply treaded water, working on finalizing data analysis and publishing past findings. Each PhD student at Northwestern costs the tax payer $214.49 per day in salaries, fringe, benefits, supplies, and general university expenditures. However, that money was used in a much less efficient manner than it otherwise would have been. For a group of ten PhD students, the expenditures impacted are on the order of tens of thousands of dollars. For a research center like ours, they easily exceed a hundred thousand dollars. Today is 12 December 2013, and all my internet portals to the government funding agencies are up and running. Over the past few weeks, I have had productive conversations with several of my program officers, who keep their chins up despite all that they had to endure. Much to my relief, no grant submission deadlines will be missed. But when we potentially face this entire situation again in January/February, multiple important grant submission deadlines and program reviews fall right into the projected time frame of another possible government shutdown. 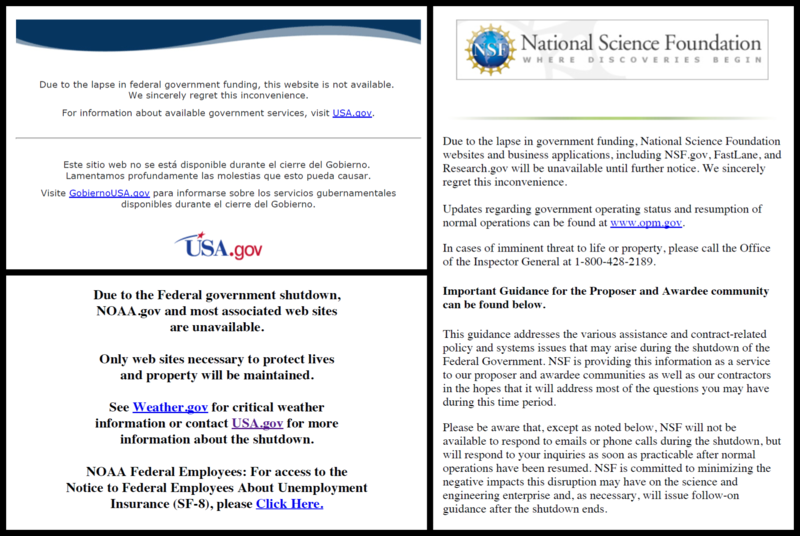 This blog post has presented concrete evidence demonstrating how counterproductive government shutdowns are to the scientific process. They slow down scientific research and they are expensive. Moreover, this account has shown how by curtailing the scientific process, government shutdowns counter domestic science policy: They force us to retreat from the frontier of science, something we just don’t do. Another blog post will review the impact of the sequester, which is in the process of taking a much deeper, permanent, bite out of US science funding than any shutdown could ever do, putting us in a massive disadvantage in terms of scientific discovery and patents when compared to Europe and Asia. So stay tuned.